We're hosting a competition! We're looking for the best amateur photography from around Aberdeen and Aberdeenshire to feature in our new Minto Calendar for 2019! We'd love to see your photos of the beautiful city and shire of Aberdeen, from rolling hills and highland coo's to our unique architecture and numerous castles, there are so many different subjects to choose from. We want to see them all! 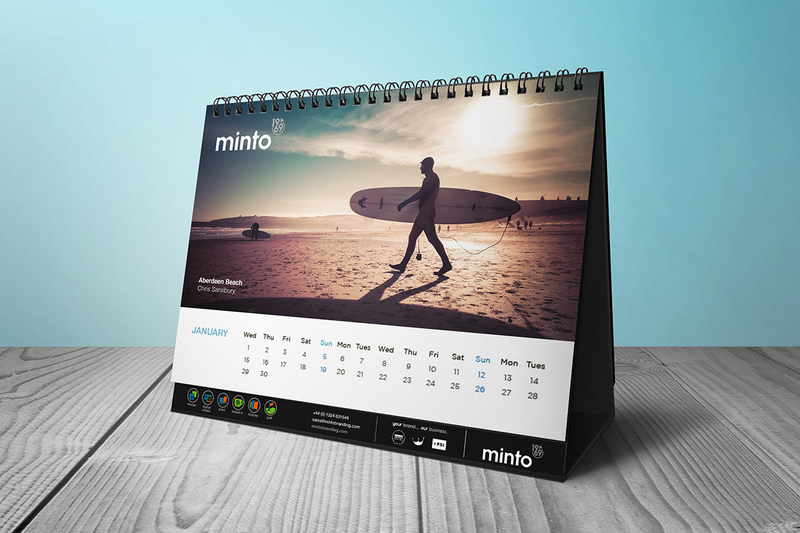 Send your entries to sales@mintobranding.com and see your image featured and credited in this excluse promotional item. · The 12 winning photographs will be credited and named on the calendar and will receive their own copy of the calendar. · The winners will be chosen at random from suitable entries received and will be required to provide us with personal information which will be used to verify their identity and to credit them on the calendar. · All photos should be landscape and of high enough resolution to print. · Entries should be sent to sales@mintobranding.com with the subject "Photo Comp - NAME". · Competition entry closes on Tuesday 31st July 2018 and the Prize (once produced) may be collected from our office on any week day between 9 and 5 or delivered as soon as feasible. · Our social media manager will choose/select the winners and announce the winner no later than Friday 3rd August 2018. · The winners will be announced on our Facebook page and notified by email or direct message on Twitter/Facebook/Instagram/LinkedIn by Friday 3rd August 2018. If any winner cannot be contacted by 5pm Friday 10th August, we reserve the right to pick a replacement winner. · Reasonable efforts will be made to contact the winners. If they cannot be contacted, or are unable to comply with these terms and conditions, we reserve the right to offer the prize to an alternative photographer chosen at random from other entrants. · The prize is as stated, is not transferable to another individual and no cash or other alternatives will be offered. · The giveaway is open to residents of Mainland UK (Excluding Northern Ireland) aged 18 years or over. · The winners agree to the use of his/her name in any publicity material. Any personal data relating to the winner or any other entrants will be used solely in accordance with current [UK] data protection legislation and will not be disclosed to a third party without the entrant’s prior consent. · Winners accept that their photographs may be used by Minto Branding for future promotional material and may not be credited. ·Photographs may not feature any living person in an obviously identifiable way unless said person has consented in writing to the unequivocal use of their image by Minto Branding for any and all marketing and print purposes. · Entry into the competition will be deemed as acceptance of these terms and conditions. · This promotion is in no way sponsored, endorsed or administered by, or associated with, Facebook, Twitter or any other Social Network. You are providing your information to Minto Branding and not to any other party.